Introduction: Inguinal hernia repairs (IHR) can be performed under different types of anesthesia techniques. Paravertebral blocks (PVB) have been used successfully as the sole anesthetic for these cases.1,2,3 However, general anesthesia (GA) remains routine practice in this surgical population, and it is accompanied by unwanted side effects and poor pain control.2 In efforts to enhance recovery and postoperative pain control, our study compares opioid usage in GA versus PVB in IHR. Methods: This is a retrospective cohort study, with Institutional Review Board permission, of adults undergoing IHR between Jan. 1, 2009 and June 1, 2015. Inclusion criteria were age ≥ 18 years and hernia repair. Exclusion criteria were chronic pain, sufentanil use, and missing data on opioid use. Median and categorized morphine equivalents (mg) of intraoperative and recovery opioid exposure use were compared by procedure and surgery type—GA, PVB, open surgery (O), laparoscopic surgery (L) —using Kruskal-Wallis and Pearson χ2 tests, respectively. Results: 600 patients met the inclusion criteria, 391 were GA+L (65%), 32 GA+O (5%), 137 PVB+O (23%), and 34 GA+PVB+O (6%). The PVB+Os had the lowest median opioid use (5mg), followed by GA+PVB+O (7.5mg), GA+O (25mg), and GA+L (25mg) (Table 1, p-value < .01). In categorical comparisons, there were significantly more non-opioid users with PVB (PVB+O-29.9%; GA+PVB+O-23.5%; GA+L-0.3%; GA+O-0.0%; p-value < .01). 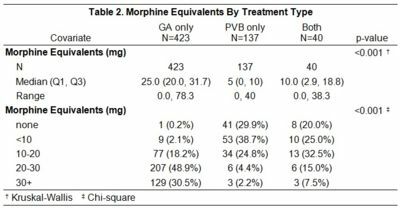 PVB only had the lowest opioid use when the comparison groups were GA only, PVB only, and GA+PVB (Table 2). Conclusions: Poorly treated pain and postoperative nausea/vomiting (PONV) after hernia repair can lead to delayed discharge.4 PVBs have been shown to decrease pain, PONV, and opioid usage.1-4 Our study reflects a large cohort of patients in a real clinical setting, and we conclude that PVBs had significantly lower perioperative opioid use than patients with GA only.